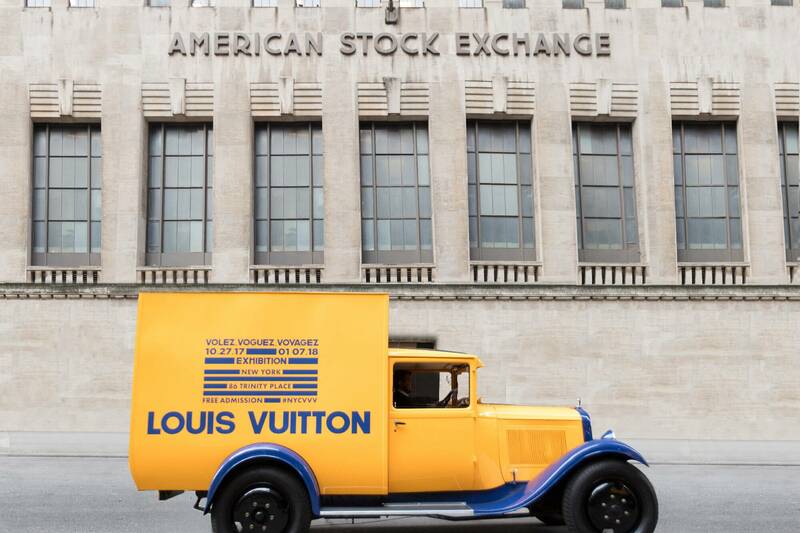 Although you would never expect to get a bargain on a Louis Vuitton bag, you can get free admission to this definitive, innovative exhibit staged in the venerable American Stock Exchange Building in Lower Manhattan. The sheer brilliance of the exhibition design is half of the fun, and we entered to find that a totally-believable simulated LV Subway stop had been installed, with arriving-and-departing trains in various graphic depictions of Vuitton signage over the years. All this was accomplished with high-tech audio/video so convincing we wanted to hop aboard. Although the exhibit begins on a high-volume techno note, we quickly transitioned to the beginnings of the Louis Vuitton odyssey, and immediately entered a rarified world of meticulous workmanship and singular design vision. Although Vuitton (1821-1892) earned his stripes as a laborer and maker of crates and trunks, he quickly grasped that the golden age of rarefied travel was at hand and he defined himself as genius-in-charge. Through several magnificent galleries, we saw stellar examples of priceless trunks and cases commissioned by the famous and infamous. A small cunning “flower” trunk, small enough to fit on your lap. A huge hulking “painting” trunk, large enough to hold-and-protect several massive canvases. (Indeed, Matisse was a customer.) Upright “desk” trunks with endless tailored leather-lined drawers for writing materials. A gentleman’s trunk, outfitted to hold shoes, walking sticks, and custom-made hat boxes. Now boarding the Style Express! A ladies’ shoe trunk, with 30 pull-out labeled drawers. Some of my personal favorites were the “book” trunks; suitable for those long ocean voyages. Custom book bindings (of course!) match the outer trunk, and everything folds out on a desk top for an instantaneous lavish library. Bound to please…a custom library. And Hollywood was well-represented with wardrobe trunks owned by Mary Pickford, Katherine Hepburn, Lauren Bacall, and more. A jaw-dropping make-up case and jewelry box, especially made for Sharon Stone, gave new meaning to the word “bling”. We learned that Vuitton trunks went through several design elevations over the years; beginning with a dignified solid-colored canvas exterior, followed by traditional vertical stripes, which transitioned to a classic small-checkered pattern, and then eventually the recognizable “LV” logo pattern that has become recognizable, worldwide. Vuitton wanted his unparalleled craftsmanship to carry his “mark”, and bring status to his company, as well as his customers. In addition, he provided every embellishment that Monsieur or Madame could envision – such as personalized initials and family crests. To my surprise, the lowly destination sticker slapped onto the side of the gorgeous luggage was considered desirous. It was thought that the amount of stickers, and the status of the destinations, was a mark of a well-traveled person, and the Vuitton family took great pleasure in amassing a huge international collection of the labels. This exhibit, which has traveled to Paris, Seoul, Tokyo, with its final stop in Manhattan, was designed by Robert Carsen and he has truly pulled out all the stops. While some of the gallery spaces are purely elegant/refined with paneled walls, other spaces were gasp-worthy simulations of “trains, planes, automobiles” . The drama of a sky-blue gallery with a soaring sail boat, is followed by a long narrow “automobile” room, and a selfie-worthy biplane room with (naturally…) LV luggage stacked on both wings. One of the highlights was a magnificent room that simulated the elegance of the Orient Express, with more of that cunning video convincing us that the train was pulling out of the station. (and we were more-than-glad to be on board) More than any other gallery, this reminded me that travel was once a very elevated experience (at least for some) and the luxurious velvet upholstery, brass luggage racks, and creature comforts a la Vuitton were part of that golden age. But this exhibit was not just about “back in the day”. Thanks to his heirs, Louis Vuitton’s banner continues to wave, and current-day artifacts are included such as artist collaborations between the company and the likes of Vivienne Westwood, Frank Gehry, Cindy Sherman and many others. Affiliations with design gurus Marc Jacobs and Nicholas Ghesquiere have kept LV at the top of the heap, and firmly on the red carpet. LV’s entry into the fashion realm is well-represented in the final all-red gallery, replete with Oscar gowns, a film loop of auspicious fashionista arrivals, and paparazzi-like video and music blasts. Cindy Sherman + Louis Vuitton = Fun! As I understand it, this definitive collection will be disseminated at the close of this exhibit. Many of these rare pieces are on-loan from their owners, or other worldly collections; and the exhibit was envisioned as a once-in-a-lifetime salute to Louis Vuitton, his heirs, and their dedication to meticulous workmanship. Curator Olivier Saillard and design genius Robert Carsen have delivered an exhibit that is regal, innovative and undeniably hip. Pack your bags and go! Another great blog post from Hammertown’s favorite roving reporter, Lynne Perrella!